It is nearly the end of another week, and I have been waiting for a free moment to post these photos. I went to an event called the Clothes Show back at the beginning of December, which has hundreds of clothes stalls and a fashion catwalk show. I trawled through loads of items before finding this coat. I first saw it in white for a higher price, before extracting this from a massive rail of clothes- I think it was the interesting text/ story print coupled with my love of literature that made me go for it. It is a piece from a sample sale- making it quite unique! I love the interesting shape of the coat, and the details such as the patterned buttons and a ladybird print lining. It was the only thing I bought there, and worth every penny. Now one of the main features of the coat is the columns of writing. 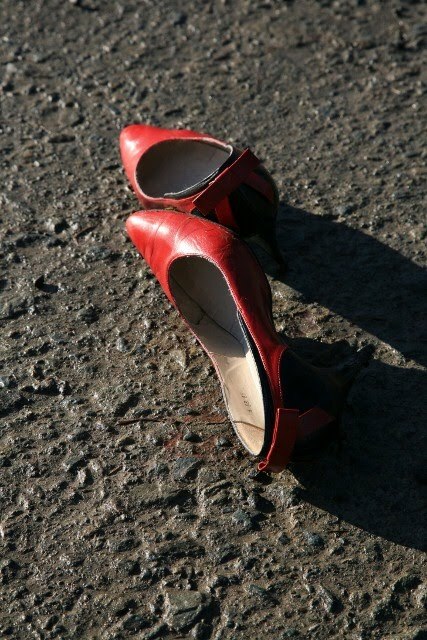 It talks of childhood memories, and a pair of special Red Shoes. So I had to wait to actually get a pair before shooting it! These vintage ones came up on Ebay, but I wasn't initially sure about them from the picture,so I didn't bid on them. However, three weeks later and they turned up in a package on our doorstep! They had been relisted, so mum bought them anyway. And guess who they fitted perfectly? A big thank you to mum! The only trouble is, I'm not allowed to stomp around the house in them as the heels are steel tipped- denting our floors would not make me popular. 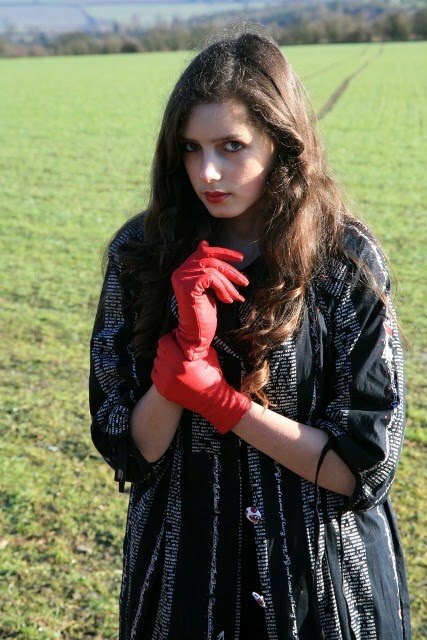 The red gloves are thrifted, and the little black dress underneath is from my fruitful Bristol charity shop-athon I had at the end of the christmas holidays. The photos were taken while on a nearby walk in an area of outstanding natural beauty, and it was the perfect day. I have recieved quite a few more blog awards recently, so a big thank you to the Trendy Fashionista and Sofie Marie for those. If there was anyone else who did too then please tell me as I am keen to acknowledge you. I have been spending the week doing some designs based on the Red Shoes (the film) and learning a five hundred word french essay! So it's been nice to have some relaxing time to do a post- I really enjoy doing them. Oh, and recently I gained my five hundreth follower... Thank you so very much to all of you who have taken the time to look at my blog, or comment on it. It realy means a lot to me, and I can't believe I only started it in June! On a final note, isn't this picture that Cecile of http://www.cecilemancion.com/blog/ did for me just wonderful? 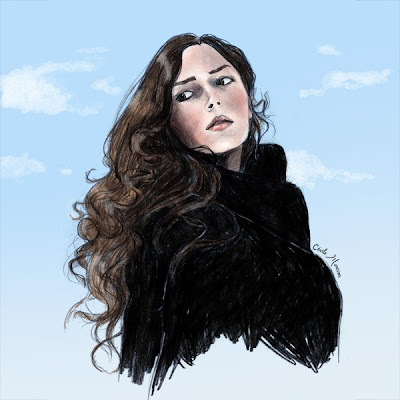 I really love her attention for detail and the way she captured my face- so a huge thank you to her, she is clearly very talented as the rest of her blog shows. You look beutiful in this coat! Beautiful painting, beautiful clothes, and don't even get me started on those shoes... Fabulous. I just love your blog. All your outfits aren't just cute- they're creative and they seem to have such good stories behind them. Besides that, the photographs are stellar. Is that what you attribute to your success as a blogger? Lovely photos, and what a gorgeous potrait! You'll always love that-love the shoes and gloves. love your shoes! and wow, that's a lot of french! if you didn't see i tagged you in my blogger award as well. go to my blog to recieve your award, congrats! When are we going to see you on the runways or on the cover of Vogue?!? Gosh darn girl, you're looking lovely as ever! oh I love your blog and style..if you want take a look at mine!!! Roz, if you want, I can send you the drawing in a better resolution or even send you a print of it, just tell me by e-mail. And I love your coat, it's amazing ! Ah, and the Cecile's drawing is amazing! That picture of you is beautiful!! And the jacket is awesome. I love the clothes show, but havent been able to go for a few years now! wonderful post: glorious pops of red, pretty painting of you, and that coat!!!! well done finding such an item- it's quite unusual. I keep meaning to go to the clothes show but never get round to it! The coat is so cool! I didnt realise at first until I read your post, but after I looked closer, i realised! I really like the seventh one down, with the scenery in the background. your photos are always sooo stunning! oh, and the illustration of you is fantastic, i really like the style of it! Thank you for the comment :) Much appreciated :) I love the one with the phonebox too, those telephone boxes are kind of something that defines london aren't they? Amazing! I love your red shoes and gloves. The painting is gorgeous too. I've just started my blog, it needs to lovely friends like you. Such a pretty dress. The red shoes and gloves look great with it. What a cool jacket! Thanks for checking out my blog! I like the way you match your shoes with the gloves. And you have a beautiful face! Wow that painting is absolutely amazing! She's very talented. I also love how you do your photoshoots - mine are so boring...! Wow that painting is stunning, she's very talented...! Also love your photoshoots, mine are so boring! I've just discovered your blog and I love it! You've a great style! If you want check out my blog and leave a comment, thanks a lot. you always dress so chic!!! the red on the hands and the feet draws the eye from head to toe, you'd be perfect for a harper's bazaar magazine stylist! You so need to model, seriously! lov so much your red gloves!! You're so pretty! and the pictures are gorgeous! !